Faith Pak '19 (left) and other Pforzheimer House members listen as Wampanoag chef Sherry Pocknett explains how some of the ingredients used in traditional Native American cuisine were gathered and prepared. Growing up in the Cape Cod town of Mashpee in a tight-knit family that observed the traditions, culture, and lifestyle of the Wampanoag people, Sherry Pocknett discovered her love of cooking. When Pocknett was a child, she received an Easy-Bake Oven, and with that she found her passion. She roasted “whatever she could find in the refrigerator” — eels, slices of bear meat, fiddleheads. On a recent night, Pocknett came to Harvard’s Pforzheimer House with pots and pans filled with traditional Wampanoag dishes, as part of her mission to show that Native American food is much more than fry bread. Faculty Deans Anne Harrington and John Durant invited students to the House for a “Native American food tasting” catered by Pocknett, as a response to students’ interest in learning about Native American culture. The Wampanoags were the tribe who dined with the Pilgrims at the first Thanksgiving, and their farming and hunting techniques helped the Europeans survive their first harsh winter in Plymouth. It’s a bittersweet memory. Years later, relations turned sour, leading to war, many deaths, and great diminishment of the Wampanoag tribe. At the museum where Pocknett works, she serves venison skewers, bison burger, fried frog legs, and turtle soup. But she brought a more subdued menu to Pforzheimer, one which featured corn, cranberries, and squash, the Wampanoags’ main staples. Corncakes made with corn meal, cranberries, and green onions were a hit. 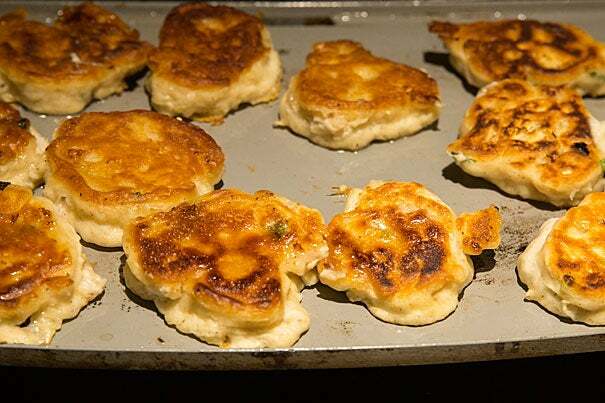 So were quahog cakes, made with the large, hard-shell clams also used for chowders. Pocknett brought the dough and fried the cakes in her portable grill, the smell wafting throughout the kitchen and the dining room. As side dishes, Pocknett brought “three sisters” rice (made with corn, squash, and beans) and butternut squash fry bread. The drink of the night was an aromatic tea made of sassafras roots, which tasted like root beer. Dessert was blueberry slump, made with blueberries simmered with dumplings and sweetened with maple syrup. That’s the kind of praise Pocknett craves. Cooking her people’s food makes her a cultural ambassador for her tribe and for Native American culture. Pocknett cooks for museums, college events, and powwows, and as she serves her beloved dishes, she explains the ancient roots of her culture, its respect and love for nature, and its spiritual beliefs and practices. Pocknett talked about the Wampanoag people’s history on the Cape Cod peninsula, and their tradition of living in harmony with nature, eating foods according to the seasons, and searching for sustenance by harvesting, hunting, and fishing. Pocknett’s father hunted bears, muskrats, and squirrels; her mother cooked recipes passed on for generations that called for herring, venison, and frog; and the children helped catch fish and harvest herbs, and in doing so learned about plants, seasons, and nature. An amiable woman with twinkling eyes, Pocknett took pleasure in sharing stories about her childhood. She talked about her Thanksgiving dinners, which occasionally featured raccoon or roasted deer haunch instead of turkey. She told students how her parents taught her and her siblings what to eat and what not to eat when they foraged, to place leftover foods in the garden as compost before that word was mainstream, and to put turtles, frogs, or eels back in the water if they were small. “With a long spear,” she said, to oohs and ahhs. Ella Duncan ’17 was grateful for the chance to learn about Native American culture outside the classroom. Coming from Littleton, the home of the Nashoba Praying Indians, Duncan was familiar with the history of dispossession and colonization of Native Americans, but she appreciated learning more. Carlos Snaider ’17 and Angela Wu ’17 also appreciated the chance to learn more about the Wampanoags’ deep connection with nature, and how they “eat the foods the seasons bring,” said Wu. Snaider, who spent some time volunteering in the Ecuadorean rainforest and became familiar with indigenous communities there, relished the opportunity to learn about similar communities in the United States. With 3 million people, Native Americans represent 1 percent of the U.S. population, and they can seem invisible. Combine all ingredients with the exception of the water and mix well. Add water 1 cup at a time so that the mixture has the consistency of a thick hot cereal. Ladle the mix onto a hot griddle covered with sunflower oil and cook the cakes until golden brown on both sides. As appears in Chef Sherry Pocknett’s Facebook Page.